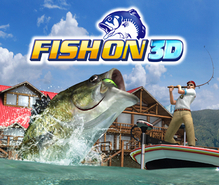 Fish On 3D was delisted from the Nintendo 3DS eShop in North America in May of 2018. According to a Wikipedia discussion started by user Kristie Ann Webb this is when several 3DS titles published by Agetec were removed from the eShop. Many of these titles remain available in Europe as of this writing where they were also published by Agetec. “FISH ON 3D features a variety of game modes appealing to those who enjoy either a realistic fishing simulation or an arcade-style experience. Earn Titles, Lures and increase your score by accomplishments achieved during the game. Tournament Mode is the main game mode that features three tournament classes: Amateur, Professional and Masters. Each tournament class has five different cups (Iron, Bronze, Silver, Gold and Platinum). A cup can be comprised of either a single stage or multiple. Challenge Mode is perfect for a quick game. There are three courses (Beginner, Standard and Expert), each with three stages. Stages have a set time limit and weight quota – catch the big fish hidden in each stage to earn a star, and collect three stars to unlock the next course. Use intuitive motion controls to experience the beauty of the 3D underwater scenery in the Exploration Mode.